Twenty five miles south of Natchitoches, Louisiana lies a portion of land with much historical relevance. At one time this parcel was known as "Hidden Hill". Today it is called "Little Eva Plantation". In the 1950's "Hidden Hill" and surrounding properties was purchased by two Texas businessmen. Sterling C. Evans, a banker, rancher, and namesake of Texas A&M University's Sterling C. Evans Library and Gus Wortham, a friend and business partner of Evans, would buy run down ranch properties, restore them, find a marketing niche, and resell these properties at a substantial profit. Evans placed importance on researching the historical background on purchased properties. This led to Evans investigating the over 100 year legend that "Hidden Hill" was the locale that was the real-life inspiration for Harriet Beecher Stowe's classic anti-slavery novel, Uncle Tom's Cabin. This book sold over 2 million copies in less than two years and was printed in over thirty seven languages. When President Abraham Lincoln met Stowe, he coined, "So you're the little lady who wrote the book that started this great war!" Evans renamed the plantation "Little Eva" after the young girl that had befriended Uncle Tom in Stowe's book. In it's heyday "Little Eva Plantaion" was almost 11,000 acres and the largest pecan orchard in North America. Late in the 1970's "Little Eva" was for sale. Elvis Presley even toured the property before buying Graceland. A. D. Taylor Sr. received 1500 acres of the property for real estate fees while the remainder was purchased by David E. Deville. On September 18, 1985, the Taylor portion of "Little Eva" was sold at a sheriff's sale. Federal Land Bank of Jackson was the high bidder. On October 12, 1987, Natchitoches Pecans Inc., a Louisiana corporation purchased 465.43 acres of the A. D. Taylor Sr. portion from the Land Bank. Another important piece of "Little Eva" history - it is the birthplace of the Famous American Folk Artist Clementine Hunter. Hunter is probably Louisiana's most famous female artist, and she remains one of the most important folk artists of all time. Her work can be seen in the Smithsonian Institute, the New Orleans Museum of Art, the Museum of American Folk Art in New York, the High Museum of Atlanta, the Dallas Museum of Fine Arts, the Oprah Winfrey Collection in Chicago and many other museums and private collections across the country. 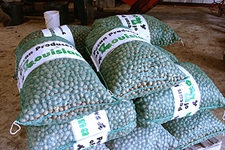 Natchitoches Pecans takes pride in providing fancy Louisiana pecans for all its customers. Please visit our online store to purchase all our delicious, quality pecan products online.